A Scandinavian cross flag with a green field with a white cross proposed by Danish heraldist Sven Tito Achen in 1984. 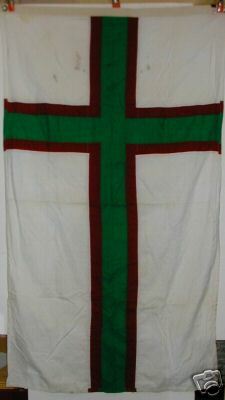 The flag proposal described by Andersson is: White field, green cross in proportions 28 : 37 (12-4-12 : 12-4-21). The proposal was made in 1991 by unidentified people. White is for the ice and cold climate, green is for the life existing despite the unfavourable conditions. Green is also for the name of the country in European languages. The Greenlanders themselves call their country 'Kalaallit Nunaat'. Source:Anderrson, Nordiska korsflaggor [and92] , and Andersson, Under nordisk flagg [and94]. Another proposal was a red field with a narrow green cross bordering the central white cross. The first serious proposal for a Greenland flag came in 1973 when five people suggested that green-white-blue flag might be appropriate. I ran into this unidentified flag. It seems to be of Scandinavian origin. Anyone knows where it could be from? I was told a few months back that this flag was a proposed flag for Greenland. Apparently, the Home Rule government organized a design contest in 1980 and 555 proposals were sent in, 293 of them from Greenland, this was one of those. In the final decision, the red and white flag with the circle used today won over the more traditional green and white Scandinavian cross designs by a close vote of 14 to 11. At first some Greenlanders were dissatisfied with the decision not to adopt a Scandinavian cross flag, but the red and white flag now seems to have been accepted and appreciated (paraphrased from comments by Jan Oskar Engene, 10 March 1996). If that fimbriation is red, then the design is the same as Greenland proposal 5, or Green's Bornholm flag. We'd need more context to know whether it actually is though, especially since it seems much longer than the Danish flag. If the person who told Fred that it was a Greenland proposal was right, then this would seem to be the one. But I'm still not sure the person who told Fred that this was a Greenland proposal was right. Apart from it being unlikely that such a flag would have been fabricated while still a proposal, I also don't think the widening of the ends of the arms is caused by stretching the cloth or turning the edges closer to the camera. It looks more like this is part of the design, and together with the length, it creates an impression of a church banner. I still wonder where Fred ran into this flag, in 2006.